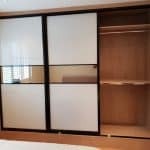 Fitted sliding door wardrobes are very popular not only with owners of newly built properties but also with customers who live in period houses. 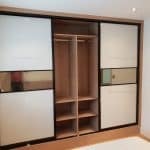 When it comes to custom sliding wardrobes there really is a great choice of design options. 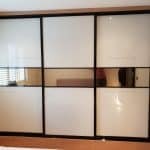 In this particular project the doors were made of white painted glass with mirror inserts and dark frames. 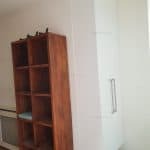 The interior of the closet included the hanging space and shelving and was made of high quality German/Austrian MDF. 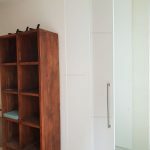 Another part of the project was the made-to-measure floating hinged door closet for storing household goods. 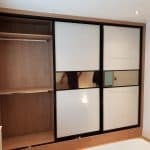 One of the reasons why people choose custom made wardrobes is not only because you choose your own design, but also the interior features of the closet. 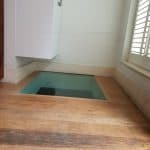 Some customer prefer having as much hanging space as possible. 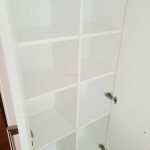 Other prefer shelving, drawers and shoe storage solution. In either case, the team of our experienced designers are here to give you an advice and inspiration.